There’s been a ton of predictions for the Golden Globes… and not just for the awards. 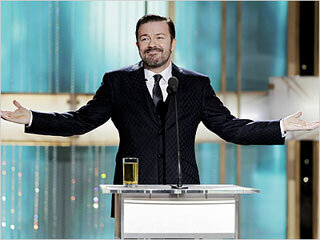 There’ve been predictions for who would Gervais make fun of at the Globes. Ricky Gervais is probably the only reason you should watch the Globes, due to their questionable nominations. I have a few ideas whom he might mock, and here’s who I think would be. Russell Brand/Katy Perry: I don’t find Russell Brand very funny, and his marriage and divorce from Katy Perry has kind of been a joke. So they’re a target. Kardashians: Okay, pretty obvious target, how could Gervais resist? Ryan Murphy: The Globes pay way too much attention over Murphy and shower him with nominations. Glee star Jane Lynch tried to take a poor stab at Gervais at the Emmys, so I’d like to see Gervais retaliate. Alec Baldwin: Baldwin’s fight against American Airlines has seemed like a really bad joke. Plus, he’ll attend because he’s nominated. Ashton Kutcher/Demi Moore: Okay, Gervais poked fun of them last year, but with the divorce, there’s now new comic material. Mel Gibson: Okay, maybe it’s kind of late to make another Mel Gibson joke. But there’s a lot of things you can make fun of Gibson: his anti-semetic rants, his divorce, and The Beaver. Plus, Gervais has taken stabs at Gibson before, who wouldn’t want to see it again? Eddie Murphy: I still have respect for Murphy, despite starring in a string of bad movies since last decade. But his abandoment of hosting duties for the Oscars, plus Brett Ratner, makes comic gold. The Globes themselves: This is the one is very clear. The Globes pick awful nominees, and were viciously mocked by Gervais last year. Expect this again. Perhaps I’m sounding mean-spirited, but I want actual award-worthy nominees, not just popular stuff just for the ratings. That’s why I liked Gervais last year, and probably again this year. « Guilds vs. Critics: Who Judges Movies Better? As crazy as it sounds, I’m actually much more excited for the Golden Globes than I’ve ever been previously (just because Gervais will be hosting). There seems to be a little bit of a different air around the show this year- people are preparing to be mocked, made fun of, and are expecting a show based on humor and Hollywood schmoozing (instead of just Hollywood schmoozing). And if the Golden Globes end up permanently becoming more of a roast-type awards show, I’d be totally ok with that. I do agree with you on that. If the Globes want to pick terrible nominees, they should make a roast for themselves. And I’m wondering what the Globes are doing to prepare from the storm they’re going to receive from Gervais. Well, that I couldn’t tell you. I’ve read interviews with actors who are all preparing to be viciously mocked, but as the for the Globes themselves I have no idea.